So I am leaving Charlotte this morning. It is a beautiful day for travel. I leave a day early because my mother-in-law is ill and I am needed at home. So often when folks go into the hospital the news is down and then up and then right and then left and so I decided better to be at home. Texting hugs only works so long. And here is my take away from GA. We are not in this alone, and we should not be in this alone. One of us can make a difference all of us make more of a difference. There are so many people in the UUA woking so hard to make this world a better place. So many people who are willing and able to set their own wants aside and work for others. I leave GA feeling so positive about our movement. I’ve go minister friends who are out there breaking down walls of injustice; who are making sure that arc of history bends toward justice just a little faster. I love them, I love their work. I love being part of their community and supporting them. I am so damn proud of them. But when times are tough it is the folk who can sit with me and really listen to my emotional messiness that i want by my side. So thank you. And it was just not my friends in Charlotte. At home friends gladly took my children in overnight. They extended their hospitality with a “no problem we can do this what do you need” attitude and “we cna pick you up at the airport”. I know my children were loved and cared for when their dad or I could not be there. It is so tough as a parent to not be able to physically be present for your child when a crisis happens. It is good to know that members of the village stepped up. I am going to remember this. More importantly my kids are going to remember this- this is what you do for people. This is the kind of radical hospitality that we are called to live out. Thank you. Hopefully all will be well my mother-in-law will heal and we will have more time with her. But if that is not to be so I go forward knowing that I am blessed so blessed. This is a photo of the plenary gathering this morning. 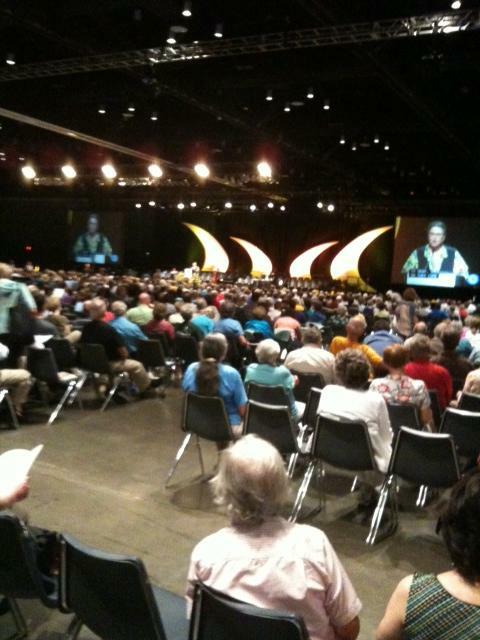 We are gather for some important discussions and votes on the governance of the UUA. Today we will be deciding whether or not to restructure the UUA Board of Trustees, we will be deciding changes on how RE professionals are credentialed, among other things. This is our democratic process in in action. I love this photo! What a wonderful end to a busy busy day yesterday. By the time the vote in NY took place I was in my hotel room and was able to watch the vote live. I am proud to live in the state of NY. There are so many couples and families that have been real for so long and now in the state of NY they have the same familial rights as all. 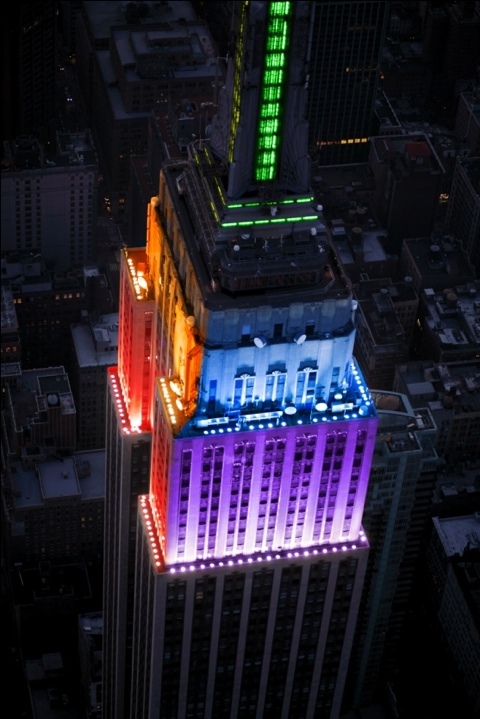 This is a wonderful step forward in civil rights in NY and in the USA! Yesterday was a whirlwind of activity and people, ideas and actions. I was able to go to some very interesting workshops. The Service Committee (UUSC) hosted a one on service trips to Haiti. The UUSC has had a presence for a while in Haiti, even before the earthquake and devastation. This year they sent down a group of medical professionals for a medical trip. They also sent down a group of seminarians. The UUSC has been instrumental in helping to build some eco friendly housing. This is so important in Haiti where there has been so much deforestation for fuel. The UUSC takes an eye-to-eye approach to mission work. They are so respectful of the people they are working with, and seek to learn with them. It is a wonderful way that the first and seventh principles are being lived out. In the afternoon I attended a workshop on “Covenanting: A process for Your Spiritual Mission Statement. It was a provocative workshop pointing out the difference between a mission statement and a covenant. And I attended a workshop on creating multi-generational small group ministry. I had a lot of opportunities to meet up with colleagues. I have had the opportunity to talk about what is happening in our congregation and in others congregations. It has been invigorating and exhausting at the same time. I ended the day by going to the Service of the Living tradition. This is the service where ministers who have received either preliminary or final fellowship, and Religious Educators who have received credentialing, and Musicians who have received credentialing. We also recognized those ministers who had died in the past year. It was a moving service and wonderful to be there with so many UUs. I heard yesterday that there was somewhere around 4000 UUs at GA. I don’t know if that number is correct but I do know there are thousands of UUs here. It is an amazing thing! Here is Alexa carrying the NYSCU banner at the opening ceremony. It was an amazing thing to see all these UUs carrying banners from their congregations or organizations. Ours could not be found for this years GA and so Alexa carried this one. I left Syracuse very very early this morning in the midst of a HUGE lightening and thunder storm. It did not bode well I thought. But we got off the ground and into the air without mishap. When I landed in Charlotte there was an information table at the airport of UUs. I wasn’t used to that. We were visible – it was great! 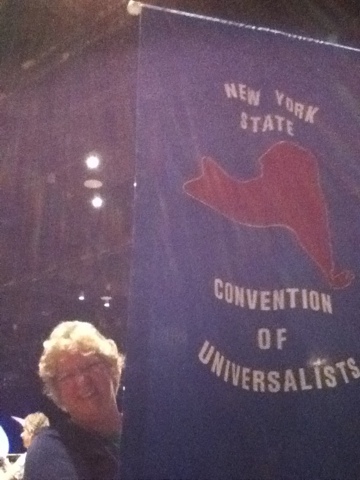 When I got to the convention center there were big welcome UUA banners out front. And when I got in – holly molly there are thousands of us. I don’t know the exact count but I am going to guess that it is 2500. It is wonderful to be in the midst of so many energetic, positive, diverse, liberal religious folk. It was a heady day full of lectures and workshops. I heard a lot about further vision of Religious Education in the UUA and how we might do it more collaboratively sharing instead of competing, open source (so to say) rather than a market place mentality. My head is full, my feet are tired and it is the end of the first day. I can’t wait to see what comes tomorrow! 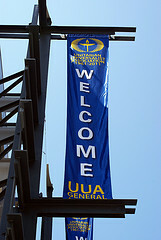 Here is a photo from UU world of the welcome banner!